Nestled in a bustling stretch of Germantown, Henrietta Red is an American restaurant offering seasonal contemporary cooking and an oyster bar. The dream of Nashville-native chef Julia Sullivan and her business partner, general manager and sommelier, Allie Poindexter, Henrietta Red boasts a convivial barroom offering a variety of natural wines, craft cocktails, and daily happy hour specials. The bar also offers a menu of shareable plates and the full raw bar selection. The restaurant at Henrietta Red focuses on simple, fresh ingredients. A wood burning oven, wide variety of oysters and shellfish, as well as crudos and many vegetable-forward dishes, drive the menu. Chef Sullivan attended the Culinary Institute of America in New York, which led her to work at acclaimed restaurants including Blue Hill at Stone Barns, Per Se, Franny’s, and Haven’s Kitchen, where she first met Poindexter. With a long history in the culinary world, Poindexter has studied and written about food, worked in hospitality, and gained the sommelier title. Together, Sullivan and Poindexter have created Henrietta Red, named in honor of Julia’s grandparents and embodying their Carolina low-country hospitality. With them in mind, we welcome you to Henrietta Red. 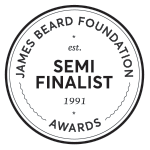 In 2018 Henrietta Red was nominated as a semi-finalist for Best New Restaurant by the James Beard Foundation.